Death Valley is about a 3 hour drive from our home in Henderson (it'd probably be closer to 2 if you weren't towing a trailer) and we've been anxious to visit it ever since we moved here last year. But as you can imagine the window for a pleasant visit is relatively short! In fact, many of the campgrounds are closed in the summer due to the excessive heat. About three months ago we booked a spot at Furnace Creek Campground for November 13-16...little did we know at the time we'd be taking a dog along! It's quite a nice campground -- well-maintained with freshly paved pads. There are even some trees which were the only ones we saw as we explored the park. For the first day we liked our spot pretty well (#30) but the second day we had some new neighbors that made it a little less fun. Mostly because our spots basically shared the same "backyard" which really cut down on privacy. I made sure to walk through the campground and write down the best site numbers for next time! The "backyard" of our campsite which worked pretty well until that middle spot got filled in with 3 tents. I really like these little battery-powered lanterns I bought from Pier 1. They're great for soft lighting around a campsite and I often hang them on Audrey's awning. Evening view in our campground. On Friday we drove through "20-Mule Team Canyon" which was a really surreal spot - imagine sand dunes on the surface of the moon. Then we drove down a 4x4 road toward "Hole in the Wall" but only made it about a half mile down - it was just so bumpy that Indie and I were getting a bit queasy. In National Parks dogs are not allowed on trails but they are allowed "where cars can go" - so we could walk him on this 4x4 road. Because there wasn't another soul around we also illegally let him off his leash to run and get some energy out and boy did he love it! Someone was worn out after their big run! Later that day we drove to Badwater Basin, which is the lowest point in the United States at 282 feet below sea level. Kinda cool!! After that we drove through the Artists Drive loop to see the sun setting on the beautiful rocks. Death Valley is a stunning place in an incredibly desolate way. We look forward to exploring it again in the future and there are so many other areas that we didn't get to see (that place is huge!). We ended up leaving one night early because our campsite had started feeling a bit crowded and it was also warmer than we had envisioned it would be (around 82 each day). Overall we were really impressed with how Indie behaved on his first Audrey experience. On Saturday we headed toward home but drove right on by Henderson and went straight to Lake Mead (which is the backside of Hoover Dam) where some of our online Airstream friends were boondocking on Government Wash road. Our goal was to have a potluck dinner and drinky-poos with them and spend the night out there and generally enjoy some hang-out time. Unfortunately, Indie wasn't on board with that plan. He was basically an oafish puppy who barked and jumped up and generally got into mischief. On the trip he'd found that he could slide open the little part on our screen door and poke his head out and see the world. Perfect, right? Well, it's hard to believe, but apparently with enough incentive he can actually JUMP THROUGH THE SMALL HOLE IN THE DOOR. <sigh> Basically Jeff and I had to take turns visiting with people and someone had to stay and dog sit. It was very reminiscent of the days when we had babies! Regardless of the puppy craziness we had a great time getting to know @thetravelinghaywoods, @aluminarium, @toddmb, @haynieruss and @van_tramp! 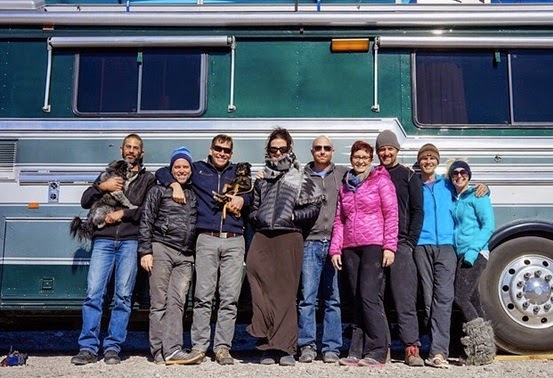 The gang pictured in front of Todd and Russ' Wanderlodge. How cool is this thing? That night around midnight a huge windstorm blew in as part of a cold front. The sustained winds were around 30 mph and the gusts were over 50 mph and boy was that loud in the Airstream! Indie wasn't the only one freaking out. Jeff had to convince me that the Airstream couldn't possibly blow over. Whew! It was a long night! We had a husky that could escape in *any* situation. I can't believe he jumped thru that little window!